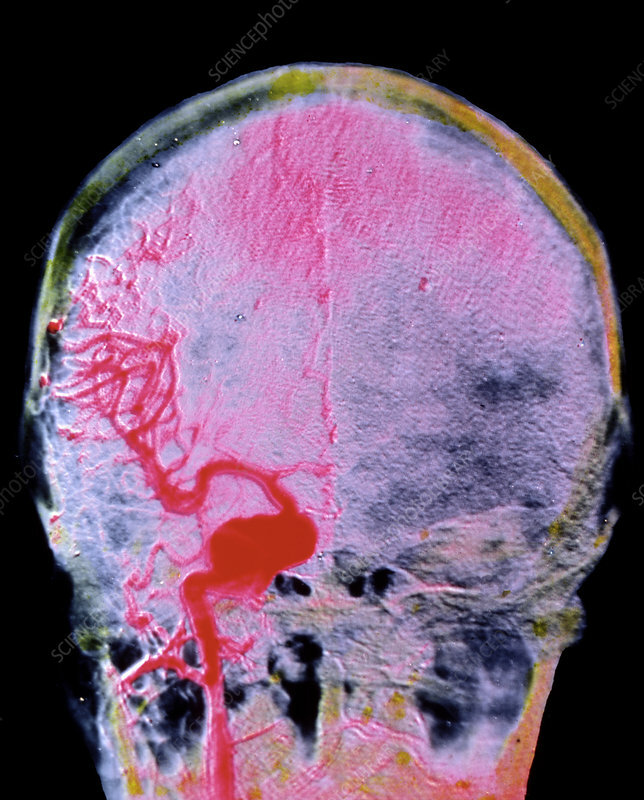 False-colour arteriograph (angiograph) of the head (rear view), revealing an aneursym (the red balloon-like swelling caused by the dilation of a thinned arterial wall) in the carotid artery. Arteriography is the x-ray examination of an artery that has been outlined by the prior injection of a radio-opaque contrast medium. Aneurysms in the brain are associated with hypertension (high blood pressure); a ruptured aneursym is one cause of a cerebro-vascular accident (CVA - a stroke), one of the major causes of brain damage especially in the elderly. Deprivation of oxygen on one side of the brain causes paralysis on opposite side of body.